The host of Late Night with Jimmy Fallon writes that the design director for popular Xbox 360 exclusive Gears of War will be on his show next week to debut his next game. 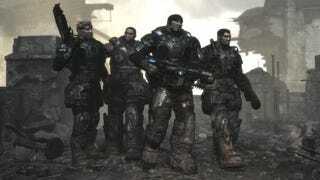 Game developer Cliff Bleszinski, who worked on both Gears of War and Gears of War 2, has not yet talked about when the final game in the trilogy will hit the Xbox 360. And it may not be Gears of War 3 that Bleszinski will be talking about. Reached for comment this evening, Late Night with Jimmy Fallon producer Gavin Purcell told Kotaku that Bleszinski's appearance will include a chat with the show's host. He declined to say what game they would be talking about, but said it is very exciting. Earlier this month, Edge reported that a "trusted U.S. publishing source" told them that Gears of War 3 won't be hitting until April 2011. That same source also told Edge that a debut teaser would premiere on April 8—the same date as Bleszinski's appearance on Fallon's show. Epic VP Mark Rein recently told G4TV that his company wouldn't be releasing any games this year. Studio People Can Fly, which Epic owns, has its own game in the works for EA, but that won't be released until the beginning of 2011, a game that may very well be known as Bulletstorm. Maybe that's what Bleszinski will be talking about. Or perhaps Epic is getting on the Project Natal or even Playstation Move bandwagon. I guess we're going to have to wait until next Thursday night when Bleszinski and Tina Fey are on the show to find out. Mark your calendars!